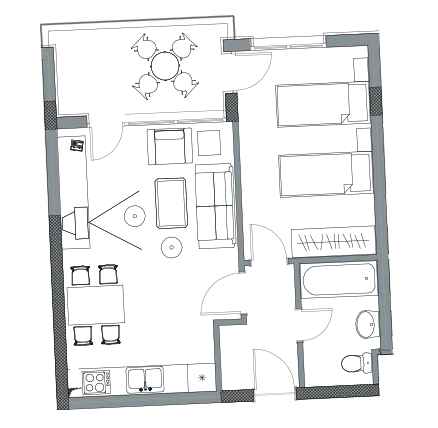 These one-bedroom apartments (2+2) are 60m2big and consist of living room and a kitchen, a bedroom, a bathroom, a hallway and a balcony. These apartments are suitable for accommodating up to 4 people, with 2 people sleeping on the big sofa bed in the living room. The beds in the bedroom can either be one big double-bed or two single beds. Some of the apartments have a view to the city of Nessebar and some to the green park nearby.